Now, I don't always remember to pick up lemons from the store and bottled lemon juice is okay, but I'm not sure if all the health benefits are there. In my first Azure Standard order, I got 10 lbs. of organic lemons and I knew I wasn't get through them as fast as they needed to be dealt with. 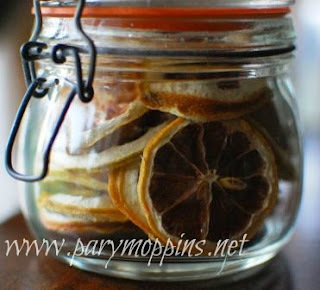 I made lemon curd and preserved lemons but I had seen a post on Food in Jars (if you like canning, check out her site; it's fantastic) about dehydrating lemons. Dehydrated lemons seemed like the perfect way to preserve the lemons for my morning concoction as well as other culinary pursuits. They could be used in drinks or could be blitzed in the food processor to make lemon powder. Lemon powder could then be used in homemade lemon pepper, to flavor whipped cream, or put in salad dressings or marinades. Wash the lemons well. Slice off the ends and put them in the compost pile. Slice the lemons about 1/4" thick and place them on the racks of the dehydrator. I was borrowing a dehydrator that only had an on/off switch so I have no idea what temperature to give you. I will tell you that I left the machine on for nearly 2 days to make sure all of the moisture was gone. That's it. Super simple. And now, I have plenty of lemon slices for my morning beverage. FYI Lemons, limes, fruits like that can be juiced and frozen in ice cube trays also, then put in freezer bags. Just whip open the freezer grab what u need and there u go. I love this idea too. Next time I may just utilize the freezing method - although the dried slices are pretty neat. I don't mess with the catalog. Instead I go to their webstie, sign in, and under "shop" I click "browse by category. That seems to be easier for me to deal with otherwise it can be overwhelming. I love Food In Jars. I think my parents have a dehydrator, and since we've been planting fruit trees it might be worth seeing if they would dust it off for me. I am fully planning on dehydrating everything I can get my hands on now that I have jumped in with both feet. :) Good luck to you and let us know if you come up with any great recipes. Well thank you kindly Miz Helen.